This might sound weird, but my grandma used to take me to the neighborhood cemetery to play when we were kids. While other kids played at the park down the road, I loved the cemetery games I’d play with my siblings and cousins. We’d visit our favorite ‘spirits’, reading their birth and death dates on their head stones and making up stories about what their lives had been like living in Washougal, WA way back when. So I guess you can say I’ve had an affinity for cemeteries since an early age. As far as local experiences go, I find that a trip to the graveyard is a great way to cast a foreign place in an intimate light. 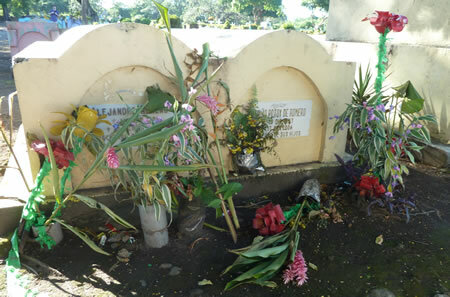 I spent a late afternoon lingering in the cemetery in Altagracia, Nicaragua and admired the plastic flowers, bleached out by so many days in the sun, placed carefully on brightly painted cement tombs. I saw families stopping by to pay their respects, and a band of kids kicking the soccer ball around at the front gates. Cattle grazed in an adjoining pasture with the looming shadow of the volcano like a sentinel keeping watch. That place felt comfortable and familiar, a pleasant mix of quiet remembrance with irrepressible sparks of life. Of course, some people visit cemeteries when they travel as a sort of pilgrimage. Some of the old stone crypts at Pere Lachaise Cemetery in Paris were spray-painted with arrows pointing the way to “Jim”, one of its most famous residents. While it wasn’t the primary motivation for my visit, the excitement of approaching the final resting place of a rock legend (in this case, The Door’s Jim Morrison) felt palpable. Inexplicably, a mysterious elderly woman had approached me at the cemetery gates and thrust a roses into my hand. When I tried to pay her for it, she declined and disappeared. 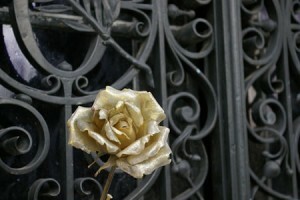 There was a rush of magic as I placed the rose atop the stark stone block that marked Morrison’s grave, sticks of re-bar piercing the air where once a bust had topped the tomb, now stolen. Recently my brother and I made such a pilgrimage, to the Greenwood Memorial Park in Renton, WA. 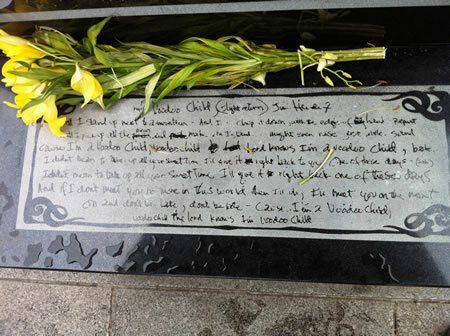 As both a music-lover and a musician himself, he’d wanted to pay his respects to two great artists buried there. 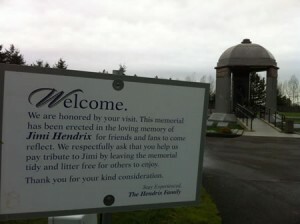 The first, Jimi Hendrix, was easy to find – in recent years, a beautiful pavilion has been built in his honor at his grave site. 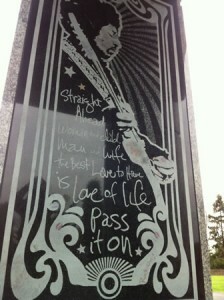 His tombstone was piled high with flowers from a constant flow of visitors, and it was surrounded by three pillars etched with images of Jimi and some his lyrics, all of which were spattered with lipstick marks. It felt like a grand tribute to such a memorable man, and it was uplifting to stand there and think of his impact on so many people around the world, even today. The second grave we’d come to visit was a bit harder to find. When we inquired at the cemetery office for help in finding Dave Day, the woman at the front desk furrowed her brow and informed us that he didn’t appear on the list. It wasn’t until my brother remembered that Day was his stage name, and was able to recall the given name of the former band member of the obscure 60’s band The Monks, that we were able to find him. He rests in the veteran’s garden, just a stone’s throw from Jimi. Just as Jimi’s soaring monument inspired awe, Dave’s humble resting place among the veterans invoked a quiet reflectiveness in my brother and I. We said a few words, and left a flower and a special token of tribute. For a moment, it felt like our own stories intersected with his. My grandma is buried in the same cemetery she used to take us to as kids. It’s too far away for me to visit very often, but I know she’s with me everytime I explore a local graveyard on my travels. And hopefully, a traveler like me stops by to see her now and then.